Legal Forum for the Land of Israel asks government’s legal adviser to put the Syrian infiltrator who reached Tel Aviv on trial. The Legal Forum for the Land of Israel said on Tuesday that it has turned to the government’s legal adviser with a demand that Hassan Higazi, the Syrian infiltrator who managed to reach Tel Aviv, be put on trial along with the people who aided him. In his letter to the advisor, Attorney Isaac Bam, the Legal Forum’s representative, said that there is a clear public interest in putting the man to trial, especially considering the severity of the infiltration, which started as a border incident and developed into a press conference in Tel Aviv, during which the infiltrator expressed his contempt for the state of Israel and its sovereignty. 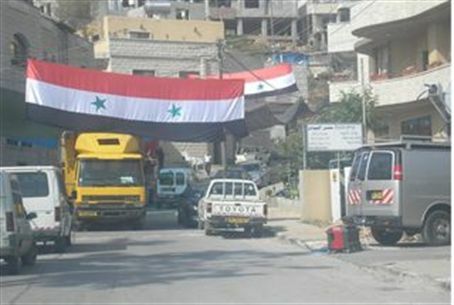 Higazi had participated in the massive border crossing from Syria into Israel near Majdal Shams on Sunday, as part of the Nakba Day protests. He identified himself as an official with the Syrian Ministry of Education whose family is originally from Jaffa. He later said during an interview with Channel 10’s Tzvi Yehezkeli, who also turned him into the authorities, that he took advantage of the commotion in the square in Majdal Shams and managed to leave the Golan Heights area with the help of local Arabs and Jewish left-wing activists. “My dream was to get to Jaffa, the city where I was born, but I expected that when I get to do it, I would be accompanied with millions of others as I read on Facebook,” Higazi told Yehezkeli. The Legal Forum noted that the punishment in Israeli law for infiltration is an imprisonment of five years, as is the punishment for aiding an infiltrator. It demanded that justice also be done with the people who aided Higazi in getting from Majdal Shams to Tel Aviv.